With the dawn of our modifications to SAGA very nearly ready, Jason's Trojans are underway, as are Jamie's Ithacans and my Myrmidons are very nearly finished (here and here) and I will post the whole force once I finish the last of the army. 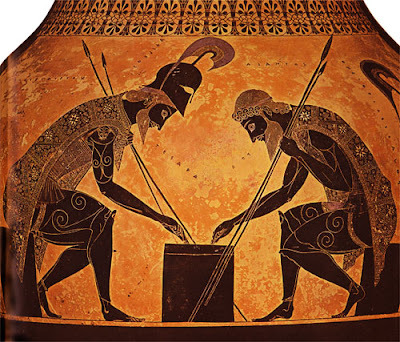 I thought that I would write a bit about what it meant to be a Greek Hero in ancient times. So, on the face of it, Greek Heroes were selfish, power hungry, defiant and frequently, not very heroic at all. To take the example of Achilles- He was the hero many Greeks wanted to be. He was vaunted as the "best of the Achaeans", a title he earned through being the greatest fighter- to quote the (terrible) movie- he was "born to end lives". In the Illiad and other epic poems, Achilles certainly does that. But Greek Heroes are not one dimensional killing machines, which is in part why they have survived so long into popular culture. Achilles in the very first passages of the Illiad is actually having a temper tantrum worthy of the foulest two year old- Agamemnon has taken his prize and he wants it back. So what Achilles does is he simply stops fighting. This works out very, very badly for the Greeks, because on the Trojan side, Hector the breaker of horses is breaking many, many Greeks and turning the tide of battle, right to the point where the Greeks are actually looking to withdraw from the invasion itself. 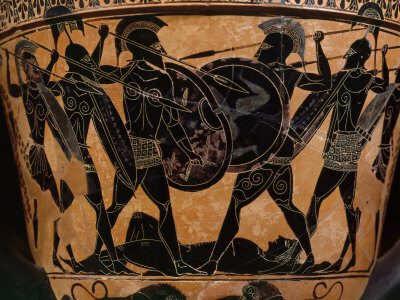 So, while all this is going on, what is Achilles doing? Well, nothing. Up until the point where his aide/partner (I am not going to explain the debate, it's a long rant) Patroclus takes his armour, and enters the fray in his stead to rally the Greeks. 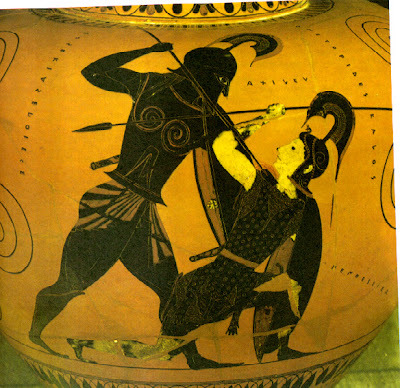 But of course, Hector the breaker of horses kills Patroclus, causing Achilles to reenter the fight, simply to slay Hector in his rage. And slay Hector he does. Then drags him about the city walls behind his chariot. Then, years later Achilles himself dies, before Troy falls. What can we learn about Greek Heroes then? They are tragic characters. Achilles is offered the chance of living a peaceful life, not going to war in Troy and living out his years in peace and happiness. He instead, opts to go to war to seek glory and well, die early. This desire is described by Aristotle as the ideal being a term called "arete". This term is a concept of essentially excellence of what you are doing, through excellence of self. This ideal manifested in competitions such as the Olympic Games, where the fastest runner was the one with the greatest arete. But, as Aristotle points out, arete is not simply winning, it is excelling at a purpose. He describes a chimeny having arete by being straight, and taking the smoke away from a fire. Simply put, arete is exelling at the purpose. Through arete, a warrior (or person) achieves kudos from their peers and others- kudos meant the same then as it does now, kudos is honour bestowed on another in admiration of a particular deed. The Greek Heroes then, desire to excel at their purpose- Odysseus in his Odyssey complains about dying an ignoble death, dashed on a rock where no one would remember him; in fact he yells out his name to the blinded cyclops Polyphemus simply so that his name will be further remembered. So, there it is. A short introduction to the mindset of the Greek Hero, I could (and probably will) write more, but for now, that is enough. Over the weekend I will put up some pictures of the Myrmidons. You guys are making it really hard for me to hold my nerve and not buy aload of Greeks and play Saga with them! Ditto above. Greeks look really cool and putting up little blurbs like that is just making me want to get into SAGA even more.